Saint Anthony of Padua is the patron saint of lost articles and miracles. 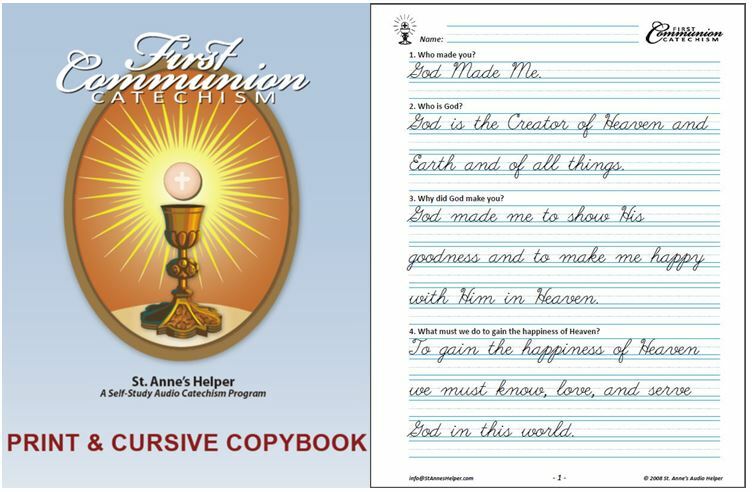 He is also a patron saint of children because he is very attentive children's prayer requests, so ask the little ones in your life to ask him to find important articles! He is one of our favorite Roman Catholic saints and is namesake for one of our sons. He's awesome at finding things! See the prayer to St. Anthony of Padua below two stories of his history. 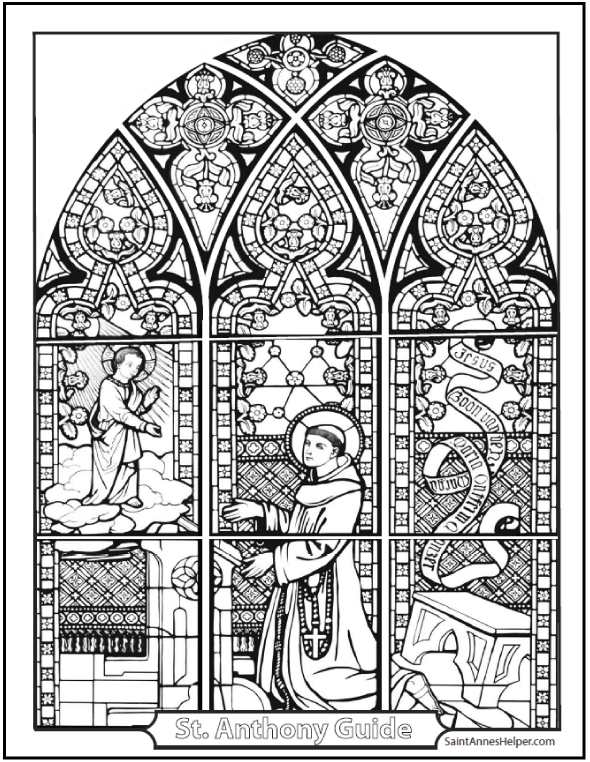 Saint Anthony patron saint coloring pages. St. Anthony according to the Pictorial Lives of the Saints - short story for kids. St. Anthony according to Butler's Lives of the Saints - longer history. 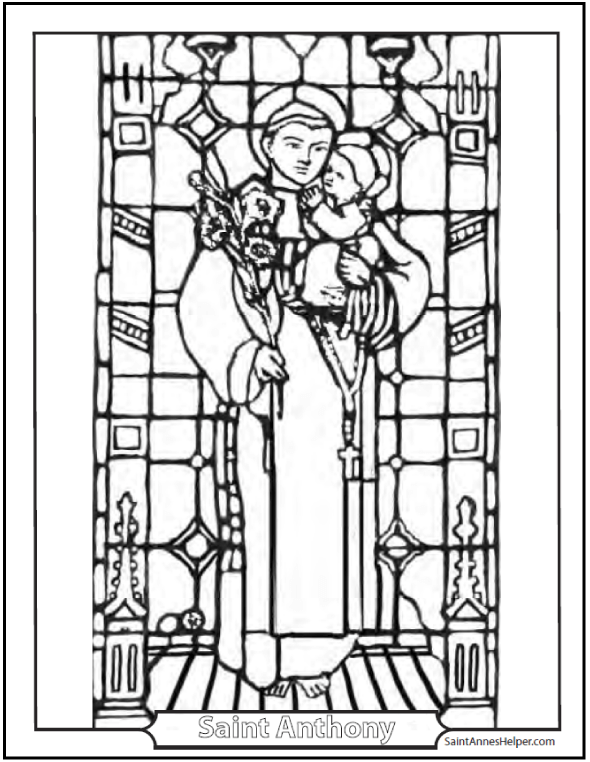 We have two beautiful stained glass coloring pages of St. Anthony patron saint of lost items. There's a neat story about the message on the ribbon in the left picture below the coloring pages. The second stained glass picture shows him holding the Infant Jesus with lilies. Enjoy! 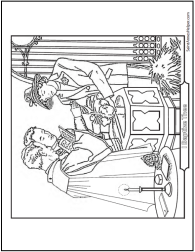 This is fun: a visitor asked what the words on the ribbon in the left Saint Anthony coloring page above. I had recognized Jesus and Maria and had incorrectly assumed that this was in Latin, yet several friends recognized the double o as being Dutch. So I asked some very handy translators on the CTNLatin group if they could discern the the words on the streamer and their meaning. 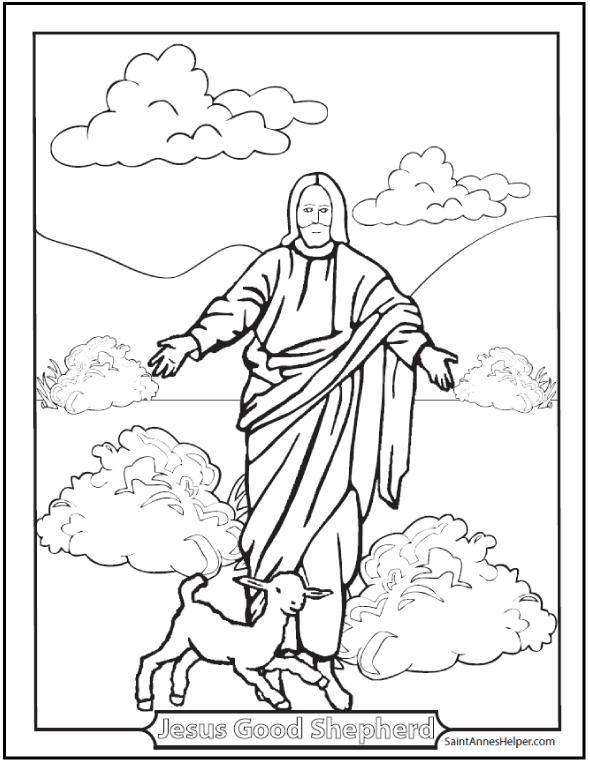 William: It isn't clear what the provenance of the original picture is, but I've had a look at the scroll in the colouring book, and, even though it's not very clear, it seems that the writing is not in Latin, but, I suspect, in Dutch: the words 'Boon van' seem to appear after the Holy Name. David: Yes, I think it’s Dutch too. Could be: zoon van de (son of the ... ). I’ll follow this up and see what I can find out. Jesus zoon van de Heilige Maria. Jesus son of the Blessed Mary. Mary take pity on us (or have mercy on us). 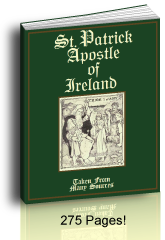 This short story is from Pictorial Lives of the Saints, with Reflections for Every Day in the Year, compiled from Butler's Lives and other Approved Sources. Imprimatur, 1878. In 1221 St. Francis held a general chapter at Assisi; when the others dispersed, there lingered behind, unknown and neglected, a poor Portuguese friar, resolved to ask for and to refuse nothing. Nine months later. Fra Antonio rose under obedience to preach to the religious assembled at Forli, when, as the discourse proceeded, "the Hammer of Heretics," "the Ark of the Testament," "the eldest son of St. Francis," stood revealed in all his sanctity, learning, and eloquence before his rapt and astonished brethren. Devoted from earliest youth to prayer and study among the Canons Regular, Ferdinand de Bulloens, as his name was in the world, had been stirred, by the spirit and example of the first five Franciscan martyrs, to put on their habit and preach the Faith to the Moors in Africa. Denied a martyr's palm, and enfeebled by sickness, at the age of twenty- seven he was taking silent but merciless revenge upon himself in the humblest offices of his community. Antonio, opening the door, charged his friend, by the love of Him "Whom he had seen, to "tell the vision to no man" as long as he was alive. Suddenly, in 1231, our Saint's brief apostolate was closed, and the voices of children were heard crying along the streets of Padua, "Our father, St. Anthony, is dead." The following year, the church-bells of Lisbon rang without ringers, while at Rome one of its sons was inscribed among the Saints of God. 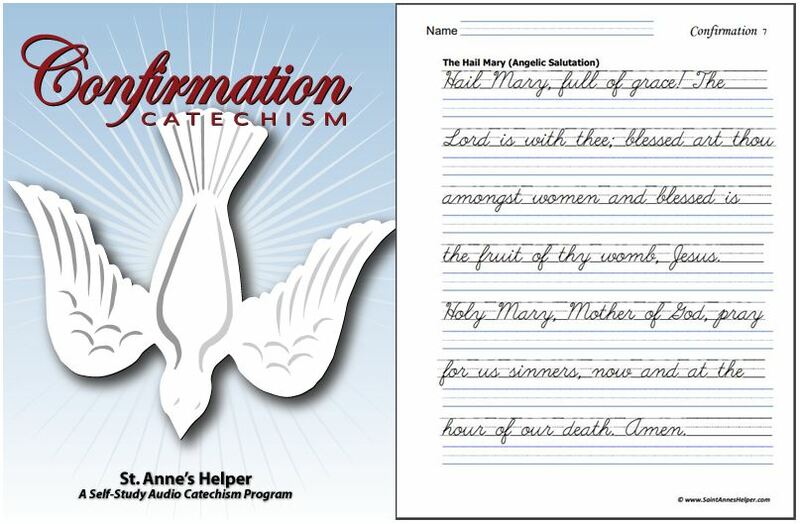 Reflection: Let us love to pray and labor unseen, and cherish in the secret of our hearts the graces of God and the growth of our immortal souls. Like St. Antony, let us attend to this, and leave the rest to God. Traditional Feast of Saint Anthony of Padua, Confessor; June 13, 1231 d.
Saint Anthony, though a native of Lisbon in Portugal, received his surname from his long residence at Padua, which city is possessed of the treasure of his relics. He was born in 1195, and christened by the name of Ferdinand, which he changed for that of Anthony when he entered the Order of St. Francis, out of devotion to the great patriarch of monks, who was the titular saint of the little chapel of his Order in which he took the habit. His father was Martin de Bullones, an officer in the army of Alphonsus I, surnamed el Consultador, who, having defeated five kings of the Moors in the battle of Orique, in 1139, was crowned king of Portugal, and died in 1185. This prince’s father, Henry of Burgundy, grandson of Robert, king of France, had begun the conquest of that country; but never took the title of king. The mother of our saint was Mary of Tevera, one of the most accomplished of women. Both his parents were equally distinguished by their nobility and virtue. They placed their son very young in the community of the canons of the cathedral of Lisbon, where his rising genius was carefully cultivated, and from his tender years he always advanced both in knowledge and devotion. At fifteen years of age he entered among the regular canons of St. Austin, near Lisbon; but not bearing the interruption and distraction which the visits of his friends there gave him, he desired, two years after, to be sent to the convent of the Holy Cross of the same Order at Coimbra, a hundred miles from the former city. The close retirement and the austerity in which he there lived astonished his brethren, whilst he pursued his studies, and read assiduously the holy scriptures and fathers. By his regular method and application, and by his sound and piercing judgment, he made a quick progress, and together with a profound knowledge of theology, acquired a perfect habit of nervous and convincing eloquence. In the meantime he inflamed his devotion by assiduous prayer and holy meditation, and nourished daily in his soul the strongest sentiments and affections of piety, without which means the heart is left spiritually dry, the usual consequence of studies whether sacred or profane, unless prayer imparts to them its unction. But the saint was called by God to serve him with greater fervor, and to be the ornament and support of another illustrious rising Order of religious men. He had lived at Coimbra near eight years, when Don Pedro, infant of Portugal, brought over from Morocco the relics of the five Franciscans, who had been lately there crowned with martyrdom. 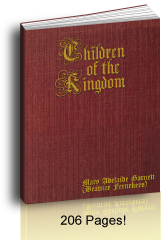 Ferdinand was strongly affected at the sight, and conceived an ardent desire to lay down his life for Christ. Shortly after, certain Franciscan friars came to his monastery of the Holy Cross to beg an alms for their community. Ferdinand discovered to them his inclination to embrace their institute, and was by them encouraged to put it in execution. No sooner was this known among the canons, but they endeavored to dissuade him from such a resolution, and he suffered much from their railleries and bitter reproaches. But he rejoiced in humiliations, and he began by them to learn to overcome himself, and to root out of his heart all lurking poison of pride. Whilst he examined his vocation, and begged the direction of the Holy Ghost, he found his resolution every day gain new strength from the esteem he conceived for an Order which inspired an eminent spirit of martyrdom, and still enjoyed the direction and living example of its holy founder. Its poverty and austerities had also charms for him. Having therefore obtained the consent of his prior, he received this new habit in 1221, in the little Franciscan convent, dedicated to the great Saint Anthony, patriarch of the monks, near Coimbra. After some time spent in solitude, prayer, and penitential austerities, burning with a desire of martyrdom, he obtained leave to go into Africa to preach the gospel to the Moors. He was scarcely arrived there, when God, satisfied with the sacrifice of his heart, visited him with a severe fit of illness, which obliged him to return to Spain for the re-establishment of his health. But by contrary winds, the vessel on which he was embarked, was driven to Sicily, and touched at Messina; where he was informed that St. Francis was then holding a general chapter at Assisi. Sick and weak as he was, the desire of seeing the holy founder of his Order carried him to Assisi. When he had seen St. Francis he desired to cultivate the happiness which he enjoyed in the company of the saint; and in order to stay nearer his person, offered himself to the provincials and guardians of Italy. St. Francis approved his inclination to renounce his friends and country; but not one of the superiors there assembled would be troubled with him, so unpromising and sickly was his aspect; for he took care to conceal his learning and talents, and presented himself only to serve in the kitchen. At last a guardian in the province of Romagna named Gratiani, took pity on him, and sent him to the hermitage of Mount-Paul, a little solitary convent near Bologna. Saint Anthony thought of nothing but of burying himself here in obscurity unknown to the world, joining the sweets of heavenly contemplation with the austerities of a penitential life, and the humiliations of such a state. He never let fall one word which might show his learning, much less anything of the sublime communications of his soul with God; but listened to everybody, and only spoke when obliged, till an accident made him known to the world. An assembly of the neighboring Dominican and Franciscan friars was held at Forli, in which the Dominicans, as strangers, were desired to make an exhortation to the company. They all excused themselves, every one saying that he was not prepared. Then Saint Anthony’s guardian ordered him to speak, and to say whatever the Holy Ghost should put in his mouth. The saint begged to be excused, alleging that he had been only used to wash the dishes in the kitchen, and to sweep the house. But the superior insisting upon his compliance, he spoke with such eloquence, erudition, and unction as astonished the whole company. He was at that time about twenty-six years old. St. Francis was informed of the discovery of this hidden treasure in his Order, and sent him to Vercelli, there to apply himself to the study of theology, and after a short time to teach the sacred sciences; yet recommending to him to make the assiduous exercise of contemplation and prayer his principal employment, lest his studies should otherwise extinguish in him the spirit of devotion and piety. Saint Anthony taught divinity some years with great applause at Bologna, Toulouse, Montpelier, and Padua, and was appointed guardian at Limoges. In all these employments he never made use of the general dispensation allowed to professors, of an exemption from any of the regular duties of his community, and he found time to preach assiduously to the people. He at length forsook the schools to apply himself wholly to the functions of a missionary preacher; for he thought the conversion of souls from vice, and the reformation of manners, called for his whole attention and zeal. He seemed formed both by nature and grace for this most important office. He had a polite address, an easy carriage, and a very pleasing countenance. His voice was strong, clear, and agreeable; he was endowed with a happy memory, and was a complete master of all the arts of persuasion. To his other advantages he added that of the most graceful action and accent, by which he knew how to get into the very souls of his hearers by seizing on their senses, having learned that man has as much of a sensible as of a rational creature. He was perfectly versed in the holy scriptures, had an excellent talent of applying them to the purpose on all occasions, and displayed in a clear light, and with inexpressible energy the genuine sense, and the spirit and marrow of the sacred text. But what made his eloquence most prevailing, and rendered it like a torrent of fire which bore down all before it, was the unction with which he spoke. For his heart being filled with the warmest and most feeling sentiments of every virtue, he poured these forth with an energy and zeal that seemed irresistible. His words were so many darts which pierced the hearts of his hearers. For he had long treasured up by the exercises of humility, silence, mortification, contemplation, and prayer what he afterwards communicated to his hearers; and his soul was itself all flame before he endeavored to kindle the fire of divine love in others. Full of a sovereign contempt of the world and himself, and burning with a desire to die for Jesus Christ, and to see his pure love reign in all hearts, he was above the reach of all temptations which could warp his integrity, or make him weaken or disguise the maxims of the gospel, which he announced with equal dignity and zeal to the great ones and the small. The learned admired the loftiness of his thoughts, and the strong images with which he painted the most sublime mysteries, and added an unspeakable dignity to the most obvious and common truths of religion and morality; yet a natural simplicity rendered all his discourses no less intelligible and easy to the most vulgar understandings. Charity and prudence took off the edge of harshness from his reprehensions, and his very reproofs were not bitter or austere, but amiable and insinuating. Whilst he beat down presumptuous sinners by the terrors of the divine judgments, he at the same time took care to raise and encourage their sinking souls by confidence in the divine goodness and mercy. He opposed the fashionable vices and growing heresies of those times with equal vigor and success. The most obstinate heretics and the most hardened sinners threw themselves at his feet, declaring themselves conquered. The frequent miracles which were performed by him much enhanced the reputation of his eminent sanctity wherever he came. The crowds were every where so great at his sermons that he was often obliged to preach in market-places or fields. He traveled through cities, towns, and villages with an unwearied zeal, and preached in France, Spain, and Italy. When he was one day going to begin his sermon to a most numerous assembly in the fields in France, the sky was on a sudden covered with thick clouds, and violent claps of thunder presaged a dreadful storm. The people began to disperse, and run to the neighboring city. But the saint encouraged them to stay, and by his prayers obtained that the audience, as if they had been covered with an invisible canopy, felt nothing of the dreadful shower of rain and hail, whilst the neighboring fields and highways were covered with a deluge. The saint was no less admirable in the confessional and in the private direction of souls than in the pulpit. Wherever he came, dissensions and animosities were extinguished, usurers restored their unjust gains, sinners melted into tears at his discourses, and by their sobs often interrupted his sermons, and every one sought his particular advice for the direction of his own conscience and conduct. In Lombardy, for the protection of the oppressed people, he put his life in the hands of one of the most furious of tyrants. Ezzelino, a native of the marquisate of Treviso, but of German extraction, having put himself at the head of a party of the Gibellins or Imperialists, made himself master of Verona, Padua, and several other cities in Lombardy, and exercised in them the most horrible tyranny during forty years. He contemned the anathemas of Gregory IX, Innocent IV, and Alexander IV. Hearing that the citizens of Padua had revolted from him, he put to death in one day twelve thousand persons of that country. The city of Verona, which was the place of his residence, had lost most of its inhabitants, and was filled with his guards, whose terrible armor added fierceness to their savage countenances. The saint, who feared no danger in the cause of God and his neighbor, went boldly to Verona: he found the streets solitary and mournful, and advancing to the palace, desired an audience of the prince. Being introduced into his chamber, he saw him seated on a throne, surrounded by his troop of murderers, who stood armed, ready to execute his bloody orders the instant they were issued. Saint Anthony, no way dismayed, told the tyrant, that his murders, sacrileges, and plunders called to heaven for vengeance upon his head, and that those whom he had slain or oppressed were witnesses before God against him. The saint said many things to the same purpose, and the guards waited every moment to hear the tyrant command him to be cut to pieces. But to their great astonishment, he descended from his throne pale and trembling, and putting his girdle round his neck for a halter, cast himself at the feet of the humble servant of God, and with many tears begged him to intercede with God for the pardon of his sins. The saint lifted him up, and gave him suitable advice to do penance. Some time afterwards he sent a great present to Saint Anthony, which the holy man refused to accept, saying, the only agreeable present the prince could make him would be to restore to the poor what he had unjustly taken from them. Ezzelino seemed for some time to change his conduct, but after the death of the saint, relapsed into his former disorders. At length being taken prisoner by the confederate princes of Lombardy in 1259, he died distracted in close confinement. Saint Anthony, when invested with several dignities in his Order, was watchful to maintain the primitive spirit and regularity in the houses under his inspection. He saw it almost in its birth exposed to imminent danger, and saved it by his zeal and prudence. St. Francis dying in 1226, brother Elias, a man of a worldly spirit, was chosen general; who, abusing his authority, began to introduce several relaxations of the rule, which tended to the ruin of its fundamental constitutions and spirit. He built a church too magnificent for the poverty which the rule required and professed, applied money to his own private use, bought himself a horse, kept servants, ate in his own chamber, and had better fare than the community prepared for him. Most of the provincials and guardians, out of human respect, were gained to his way of thinking; and the rest, who saw that the tendency of such an innovation was to open a door to relaxations which must necessarily extinguish the spirit and glory of the order, had not courage to speak against it. Only Saint Anthony and an Englishman named Adam, boldly opposed and condemned these abuses; but were loaded with injuries and ill treatment, and only by flight escaped perpetual imprisonment in their cells, which the general with several provincials decreed against them as turbulent and seditious men. They addressed themselves to Pope Gregory IX by whom they were graciously received and heard. His holiness summoned Elias to appear before him at Rome, and having examined into the abuses by him introduced, deposed him from the generalship. Anthony was at that time provincial of Romagna; but took this occasion to extort by importunities license from the pope to resign that post, and also to leave the court where his holiness earnestly desired to detain him. He retired first to Mount Alverno; thence returned to his convent at Padua, which he had pitched upon for his abode some time before he was provincial of Romagna, and where he had formerly taught divinity and preached. After his return he again preached the Lent there with such fruit, that the whole city seemed changed by his sermons. Then it was that he put the last hand to the Latin sermons which we have, though not as he preached them; for he diversified them according to circumstances, and spoke as the ardor of his soul directed him. They are no more than general heads or common places, destitute of the ornaments and flowers which he added in speaking. When Lent was over, Saint Anthony being much spent with labor and his penitential life, finding also his health and strength declining very fast under an inward decay, he desired to give himself some interval between business and eternity. He therefore retired out of town, to a solitary place called Campietro, or Field of Peter, there to attend solely to himself and God, and by fervent prayer to dispose his soul for the enjoyment of God; for he knew that his earthly pilgrimage was drawing to an end, and that he was then called to receive the reward of his labors. He took with him into his solitude two companions, men of great virtue. His distemper increasing very much upon him he desired to be carried back to his convent in Padua; but the crowds of people pressing to kiss the hem of his habit were so great and so troublesome, that he stopped in the suburbs, and was laid in the chamber of the director of the nuns of Arcela, where having received the rites of the Church with many tears, he recited the seven penitential psalms, and a hymn in honor of the Blessed Virgin, till he gave up his happy soul to him who had created it for his own great glory, on the 13th of June, 1231, being only thirty-six years old, of which he had lived ten in the Order of St. Francis. At the first news of his departure the children ran about the streets crying out: “The saint is dead!” Innumerable miracles testified his sanctity, and he was immediately canonized by Pope Gregory IX in 1232, whose bull was dated at Spoletto. That pope had been personally acquainted with the saint, and was a great admirer of his virtues. Thirty-two years after his death, a stately church was built in Padua for his Order, and his remains were translated into it. The flesh was all consumed except the tongue, which was found incorrupt, red, and as fresh as it was whilst he was living. St. Bonaventure, who was then general of the Order, and present at this ceremony, took it into his hands, and bathing it with his tears, and kissing it with great devotion said: “O blessed tongue, that didst always praise God, and hast been the cause that an infinite number learned to praise him: now it appears how precious thou art before Him who framed thee to be employed in so excellent and high a function.” The tongue is kept in the same church in a most costly case. This is at present a great and famous house of conventual Franciscan friars, which often furnishes the university, which is certainly to be ranked among the best in Europe, with able professors. The sepulchral monument of the saint in the church is exceeding rich and magnificent, and the basso-relievo with which it is adorned, a master-piece of art. The costly lamps which hang before it are the several presents of many cities. The Portuguese likewise honor him with singular veneration. On his miracles, Papebroke the Bollandist may be consulted. Pope Gregory IX in the bull of his canonization says: “We therefore commanded the said bishop, (of Padua,) brother Jordan, prior of St. Bennet’s, and brother John, prior of St. Austin’s, a monastery of the Dominicans in Padua, to make diligent scrutiny into the miracles wrought at his sepulcher, and into the merits of his life. Having seen the authentic proofs of the miracles of the aforesaid venerable man, besides what we know ourselves of his holy life and conversation, of which we have had experience, we, by the advice of our brethren, together with all the prelates with us, have enrolled him in the number of the saints.” He had said before in the same bull: “Saint Anthony, residing now in heaven, is honored on earth by many miracles daily seen at his tomb, of which we are certified by authentic writings." Whilst we admire the graces and extraordinary gifts with which God was pleased to glorify his servant, we must not forget that he was raised so high, only because, by divine grace, through the paths of self-denial and humility, he had learned perfectly to die to himself, and to be nothing in his own eyes. Pride makes our hearts an abomination to God, and puts him at the greatest distance from us. This is the deep wound of our souls, the main-spring of all our passions, the deadly poison of virtue, the fortress of the devil, and the source of all disorders. If we perfectly root out this evil, then will divine grace begin to establish its reign, and display its treasures in our souls. History of Saint Anthony of Padua - His genuine life has received several interpolations from popular reports of no authority. But Wadding’s Annals of his Order furnish us with good memoirs relating to his life and actions. See the judicious notes of the Bollandists, Acta Sanctorum Junii, t. 2, p. 706. Ragnaud, t. 8, Mic. Ant. Bibl. Hisp. and Andreich. St. Anthony is the patron saint of lost items. If you loose something, say a quick prayer to St. Anthony and he will find it for you. Saint Anthony is the patron saint for the Capuchin order of Franciscans. If your name is Anthony, he his your patron, too. The same for Saint Anthony high school, hospital, and college. Say once a day for nine days, especially beginning on June 4 and ending on June 12, the eve before the Feast of Saint Anthony June 13. Some pray a Novena to Saint Anthony on thirteen consecutive Tuesdays, according to Pope Leo XIII's instructions, or on all Tuesdays. O White lily of purity, sublime example of poverty, true mirror of humility, resplendent star of sanctity, O glorious Saint Anthony, who didst enjoy the sweet privilege of receiving into thy arms the Infant Jesus, I beseech thee to take me under thy powerful protection. Thou in whom the power of working miracles shines forth among the other gifts of God, have pity upon me and come to my aid in this my great need. Cleanse my heart from every disorderly affection; obtain for me a true contrition for my sins and a great love of God and of my neighbor that serving God faithfully in this life, I may come to praise, enjoy and bless Him eternally with thee in Paradise. Amen. Butler's Lives (1866) as compared to Butler's Lives, Sarto Books, 1982 (NOT Thurston and Attwater's). Catholic Encyclopedia, 1918. Saint Anthony, pray for us! 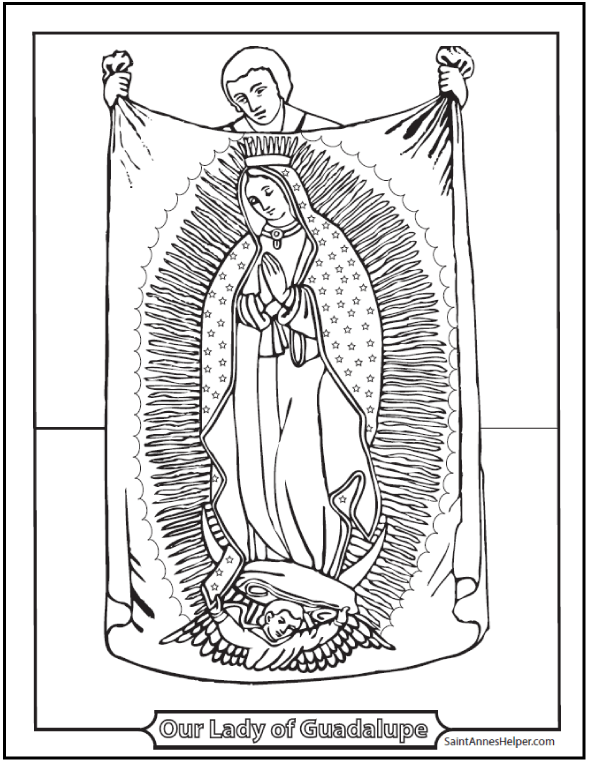 See many Catholic Saints coloring pages here.